Physical Features: Edwards Plateau, rolling hills below escarpment; spring-fed Sabinal, Frio, Leona, Nueces rivers; cypress, cedar, other trees, including maple groves. Economy: Agribusinesses, hunting leases, light manufacturing, tourism. History: Mission Nuestra Señora de la Candelaria founded in 1762 for Lipan Apaches near present-day Montell; Comanches harassed mission. U.S. military outpost established in 1849. County created from Bexar in 1850; re-created and organized in 1856; named for 1778 governor of Coahuila, Juan de Ugalde, with name Anglicized. Race/Ethnicity: (In percent) Anglo, 26.5; Black, 1.3; Hispanic, 71.4; Asian, 0.9; Other, 1.3; Two or more races, 1.0. Vital Statistics, annual: Births, 429; deaths, 233; marriages, 152; divorces, 21. 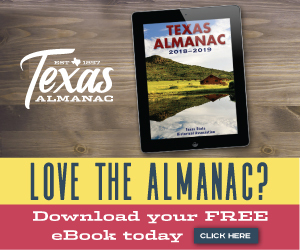 Recreation: Deer, turkey hunting; Garner State Park; water activities on rivers; John Nance Garner museum; Uvalde Memorial Park; scenic trails, historic sites. Minerals: Asphalt, stone, sand, gravel. Agriculture: Cattle, vegetables, corn, cotton, sorghum, sheep, goats, hay, wheat. Substantial irrigation. Market value $112.5 million. UVALDE (16,609) county seat; vegetable, wool, mohair processing, tourism; opera house; junior college, A&M research center; hospital; Fort Inge Day in April. Sabinal (1,687) farm, ranch center, tourism, retirement area. Other towns include: Concan (500); Knippa (648); Utopia (222) resort; Uvalde Estates (2,309). Yuccas in bloom along Texas 55. Photo by Robert Plocheck.